Pork neck is hard to mess up, so to cook a delicious dish can try even a beginner cook. 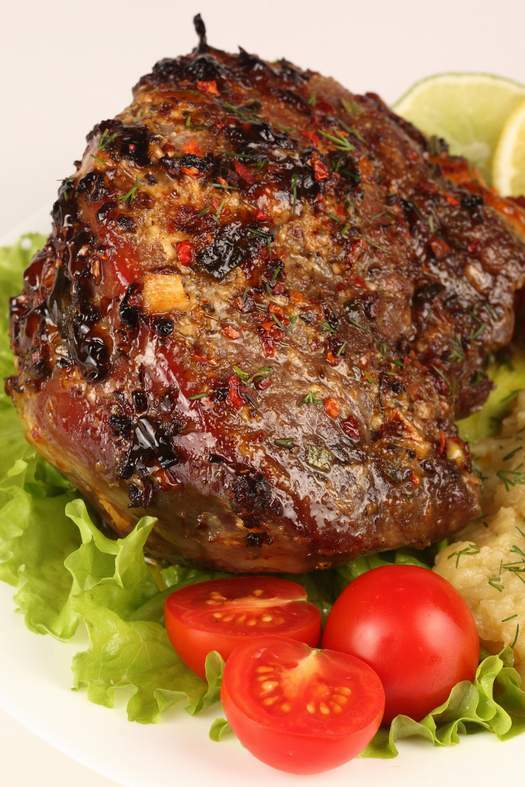 The meat of the neck veins contain fat, so the dishes are tender and juicy. For cooking you can use both fresh meat and frozen. The neck is fried, baked, stewed. It goes well with a variety of side dishes. Pork neck rinse under running water. A couple of juicy carrots cut into long bars. Free from peel a few cloves of garlic. Make the piece of meat crosswise punctures, insert them carrots and garlic. In a small bowl, stir soy sauce with a spoonful of liquid honey. Add freshly ground black pepper, crumble a couple of dried chili peppers. Cover this part of the pork neck and leave for 3 hours. Marinated meat wrap in foil and bake in the oven. On the side, serve a variety of fresh vegetables. Marinate pork neck in one piece in sour cream mixed with mustard. Mushrooms cut into slices, onion rings. Fry in a pan the mushrooms and onion, until the mushroom flavor. Spread the baking tray with foil, folded several times, put her meat. To push meat through the press a few cloves of garlic, add salt to taste. Place on top of sauteed mushrooms. Foil wrap and bake meat in the oven.Make garnish buckwheat. Slice the pork neck across the grain into medallions. A little culinary beat off with a hammer. Onions cut into large rings. The amount of meat and onions should be about the same. Put meat and onion in p/e package, leave for a few hours. Marinated meat and salt, add the mixture of peppers, spread in a single layer on a baking sheet. Pour cream or sour cream and put in the oven. Ready hot meat sprinkle with dill. A piece of pork cut into layers, repel, salt and pepper. Potatoes cut into kruglyashi. Onions chop and fry in a skillet until Golden brown. Place in a deep baking pan a layer of meat, layer of onions, layer of potatoes. Make a dressing made of mayonnaise and tomato paste. Sprinkle with grated cheese and bake in the oven. If you love meat with a fried crust, when baking pork neck in foil, open foil for 10 minutes until tender. If meat is baked in the sleeve, the sleeve pierce and hold the meat in the oven for another few minutes. Layers of pork neck repel, sprinkle with salt and pepper. In a bowl beat the egg on a plate put the breadcrumbs. Chopped meat dipped in egg, roll in breadcrumbs and place on a hot griddle. Fry for three minutes on each side.